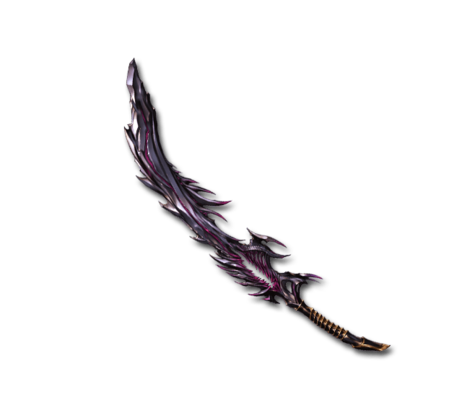 Character UnlockObtaining this weapon unlocks a character. Drawing additional copies beyond the first will instead earn a Gold Moon. JP TitleIn the past many weapons had custom titles. Now replaced with series titles in game. This weapon's blood-red light pulsates to the rhythm of despair. In the end, the wielder will fall headlong into the sprawling nothingness below. Dark Down Massive Dark damage to a foe. Applied during the attack phase. On the next turn, it'll have 2 turns remaining..
On the next turn, it'll have 2 turns remaining. now affects all allies. Awaken Expend 30% of current HP to deal 30× current HPPlain DMG = Current HP * 0.3 * 100 as Plain damage to all foes. Keep a fully-uncapped copy for mainhand. Others are safe to reduce. Do not use as fodder. This is an excellent Plain Damage weapon, very useful for Slimeblasting. This page was last modified on 15 April 2019, at 04:35.